Lovin’ summer in south central Wisconsin. We really shine in the heat of summer with cookouts, deck-time, and sleeping with the windows open. Of course when it gets really hot there’s always the air conditioner. But what if you could sleep with the windows open and still be comfortable in a Wisconsin heat wave? It can be done with the right ceiling fan in your bedroom. Before you buy one there are a few things to consider. So, when you dump a fan in the cart while you’re at the big box store picking up paint and garage shelving brackets, hang on a sec. This is an appliance. It’s supposed to run reliably, like a refrigerator. So how can that happen with a super cheap fan? What’s the motor like? Let’s pop the hood and take a look. 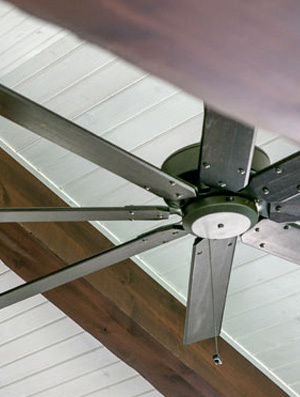 A big box store ceiling fan can be sold at a low cost because parts inside the motor housing, and even the blades, are made of plastic rather than metal. They’ve even got fans considered purely decorative that aren’t rated at all. Yup, that’s why there is no rating info on that box to compare with other fans you’re considering. Look at this: this one’s rated, but it has airflow in the 2-4000 CFM range. Yikes, that’s the fan’s airflow in cubic feet per minute. Think that will keep you cool in a Wisconsin summer? Let’s take a look at fans by comparing performance. Here’s what you need to consider: ceiling fans are required to label their cartons and catalogs with the fan’s performance rating measured at its highest speed. The label shows you airflow (CFM or cubic feet per minute), the fan’s electricity consumption in watts, and the efficiency, which is a ratio of the CFM’s and the electricity you’re buying to run the thing. I’m guessing that long after you buy the fan you’ll be paying for the power to run it, so you want it to be efficient. But even more importantly you want it to really move the air. That’s airflow. Airflow is the most important factor in a fan, believe me. A fan that creates more airflow allows you to turn the thermostat up, using less air-conditioning, and that will really save you money for years to come. While keeping you comfy TONIGHT. Checkout our website for the details on quality ceiling fans from Madison Lighting. You’ll find that there’s a lot more to a fan than how it looks. You’ll see why we’re big fans of quality ceiling fans.